The trucking industry is entering into a new year and this time it has full potential to grow even more than 2018. Especially the e-commerce industry has a great impact on the growth of the trucking industry. The trucking industry trends will continue to expand to the number of $3.2 trillion by the year 2020. Undoubtedly, the upcoming trends in this industry will help transportation enter into a new era with a potential to become stronger than earlier. 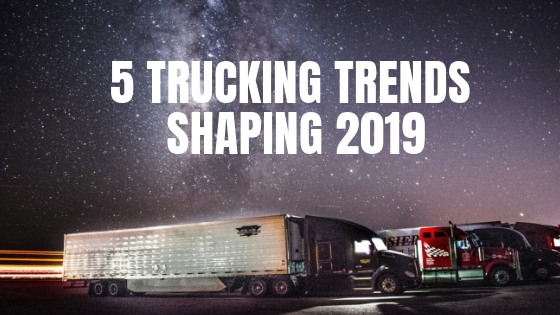 Having said that, here are the top nine trucking industry trends to watch for in 2019. COMPENSATION. Trucking shifted down a gear as it concluded a banner year in 2018. A decent but not great 2019 is forecast for trucking, and most of what I’ve been reading is saying the same or worse for the general economy. Even so, low unemployment and relatively strong freight demand is a recipe for above-average compensation hikes for owner-operators. THE INCREASE OF TRUCK DRIVER PAY. Over the last few years, companies have been paying truck drivers more than ever. Trucking companies had begun to increase wages hoping to close the gap for driver supply and demand. Trucking companies hope this overall increase of truck driver pay will appeal to younger drivers. The average American truck driver is 45 years old. THE IMPLEMENTATION OF NEW TECHNOLOGY. Technology is constantly being incorporated into our lives, our jobs and our society and trucking is no exception. Truckers rely heavily on dashboard cameras to ensure the safety of themselves, their goods and other drivers on the road. In addition to providing better on-road safety, it also saves owner-operators and trucking alike money when it comes to insurance claims. Electronic logging devices have also created waves in the trucking community. By law, truck drivers must have an ELD in their semi to monitor their drive time, speed and work hours. While this technology has given trucking companies better insight into what their drivers are doing at all hours of their day, it also has sparked an outrage. ELDs and cameras are two hot trucking trends you will hear a lot of in the year to come. ELECTRIC TRUCKS. Unlike autonomy, this twin whiz kid of the trucking world has a clearer path for development. This year through next, more fleet testing and then commercial production of electric and hydrogen-electric trucks will be under way with newcomers Nikola, Tesla and Thor, as well as established truck makers, all working with some size of truck, as heavy as Class 8. Expect scrambling as truck stops and other players try to build infrastructure to support alt-energy trucks. And I can’t help but think some of the e-truck proponents are salivating over the day when diesel prices bounce high again. Like any honeymoon, the surprisingly low prices of petroleum-based fuels won’t last forever. HOURS OF SERVICE. The Federal Motor Carrier Safety Administration will propose a revised rule, thanks largely to Administrator Ray Martinez, who has given more than lip service to that goal. True to his and drivers’ mantra, “flexibility,” the revision will try to remedy the lack of it in the current rule, notably the sleeper berth split. As to the demon gadget that measures those hours, don’t expect changes in the electronic logging device mandate. The bright side: Whenever a new hours rule takes effect – unlikely to be in 2019, given the speed of major rule changes – with luck ELDs will measure work and rest hours that make at least a little more sense. What other trends do you see that will affect trucking this year? Comment below.